PERC recently acqui red ownership of some valuable real estate in the Florida Keys. To the staff’s disappointment, it was not winter office space. 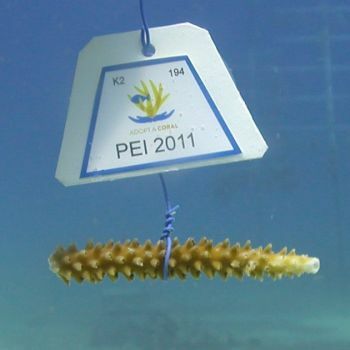 Instead, we adopted a piece of Staghorn coral transplanted by the Coral Restoration Foundation. The property is a gift from the 2011 Enviropreneur Institute Fellows. Restoring Florida’s coral reefs is the mission of the Coral Restoration Foundation. By planting nursery-grown brood stock in restoration sites, this organization is helping reverse the impacts of hurricanes, boat landings, and nutrient loading. Brett Howell, 2011 PEI alum, is spearheading an effort to create a market-based approach to coral reef restoration. If you’d like to adopt some transplanted coral, visit this site.